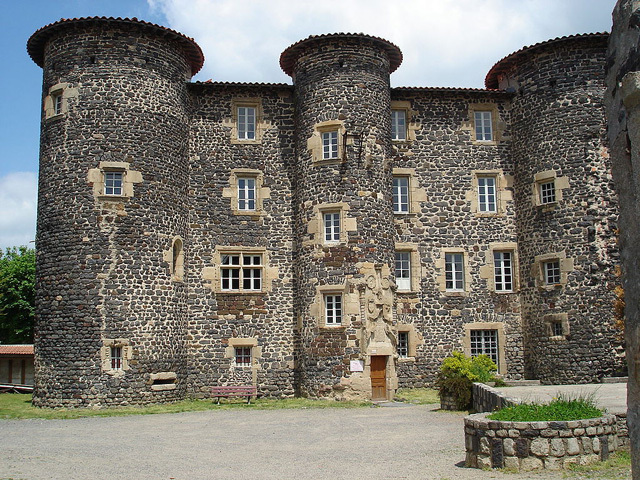 Location: Monastier-sur-Gazeille, in the Haute-Loire departement of France (Auvergne Region). Notes: Château du Monastier-sur-Gazeille is a castle located in the municipality of Monastier-sur-Gazeille in the Haute-Loire. Monastier being a walled city, a dungeon must have existed very early. After the occupation of Monastier by the English in the fourteenth century, the first castle was built abbey then burnt during the religious wars. Château du Monastier-sur-Gazeille was rebuilt in the sixteenth century and served as a residence for 130 years to the powerful family of Sennecterre (Saint Nectaire) which provides several abbots. It now houses a museum and intercommunal music school. This monument is the subject of a classification as historical monuments since February 28, 1966.